On a wide, flat western Virginia field, home to the Culpeper Barnstormers radio controlled aircraft club, a bright white DJI Phantom 3 hovers in the afternoon sun like some oversized insect from the future. One of our colleagues from the NGO Action Against Hunger (ACF International), literally brand new to drone flight as of this afternoon, is at the controls. A smile spreads across his face, fingers nimbly maneuvering the joysticks. “I think I can do this no problem,” he says. “It’s much easier than I realized.” The Phantom darts up and to the left, pauses for just a moment, then dips and settles into the swooping arc of a flawless figure eight. Chris Huston, our technical instructor from Unmanned Experts, talks him through the simple controller movements that bring the vehicle back around in a gradual descent to land at peace on the springy grass. One day prior I’m in front of a roomful of colleagues from NGOs, UN and US government agencies in a narrow conference space at the Culpeper Holiday Inn Express. 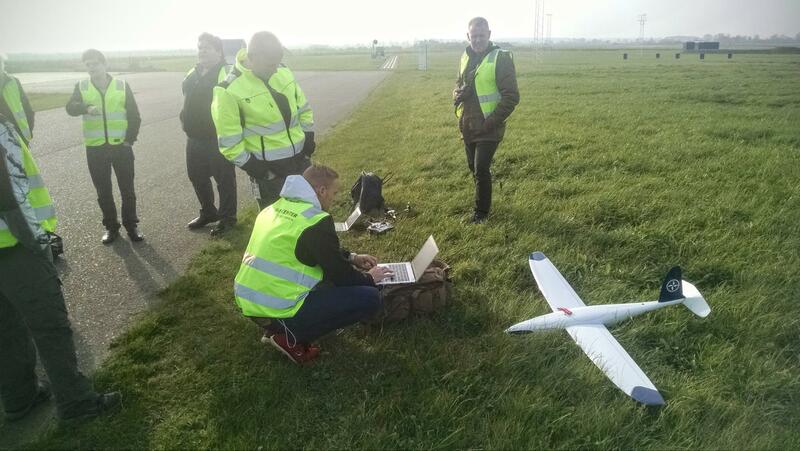 The UAViators Humanitarian UAV Network is helping put them through the paces of humanitarian UAV operations. There’s a noticeable sense of unease. Our Unmanned Experts trainers have been blazing for the past couple of hours through some fairly dense material on flight mechanics, airframes and control systems. Much of that material, despite the undeniable underlying commonality of the physical processes with small civil drones, draws upon examples with overt military implications. Some folks in the group, Patrick and I foremost among them, express serious doubts over the relevance and the appropriateness of the military connections. It’s time to troubleshoot the situation. Yet when we get up in front of the group to take their temperature, reframe the issues of technology within civil-military coordination and gauge the need for a course correction we get interestingly mixed responses. Yes, there is an unequivocal requirement to maintain clear lines between civil and military technologies and their applications. But the group turns out to be surprisingly more concerned about the level of complexity and implied cost than they are about the theoretical consistency of civil – military boundaries per se. Offering to re-route the discussion entirely towards humanitarian case studies instead of a deep dive to end the day on sensor payloads we’re told by the group that actually they’d prefer the sensor discussion at this point just to power through the technical framework to its conclusion. And so down we plunge during the day’s final two hours into the murky contours of photogrammetry, Lidar, multispectral and hyperspectral imagery. With the following day’s humanitarian case studies, code of conduct discussion, practical photogrammetry walk-through, and hands-on flight training concluded, the arc of the event veers towards a concluding simulation exercise on the humanitarian response to the earthquake in Nepal. The students are given a challenging scenario related to mapping for assistance with damage assessment in Kathmandu along with a list of key questions and elements to consider. What types and numbers of vehicles would be required? What kinds of cost trade-offs present themselves? How can they mitigate risks before during and after the mission? What sorts of implications exist within the situation for use of the humanitarian UAV code of conduct? Can they frame the range and utility of the information products that might be produced in response to this situation? This exact point becomes the most gratifying of the entire training for me. One of the trainees up towards the front of the room brings the scenario location into Mission Planner software and is already in the process of running the calculations on flight time. Another group is deep in dialogue about community engagement. A third is assessing the risks involved in the cluster of nearby buildings and struggling with the issue of appropriate government permissions. Each gets up in turn to present their project proposal and each demonstrates a higher level of thoughtfulness, acuity, and analytic sophistication than many of the actual UAV operators deployed to Nepal. It seems that despite the early hiccups around civil – military distinctions we’ve done our job well to orient this group towards safe, ethical and effective drone usage for future humanitarian activities. The UAS Test Center is located about an hour and a half outside the city of Copenhagen at the Hans Christian Andersen airport. Not too long ago the airport fell below the minimum threshold for commercial flight traffic and was at risk of being decommissioned. The government of Denmark, along with the local government in that area and the University of Southern Denmark, was able instead to repurpose the facility into a leading-edge center for research and testing of unmanned aerial systems (UAS). We’re here to team up with the university, the test center and DanOffice on a humanitarian UAV training which runs in conjunction with this years’ annual Nethope Summit. Unlike in Culpeper, probably because we’re at a formerly commercial airport in Europe, the aviation discussion this time centers entirely on civil applications. The lead technical trainer is a blustery old Dane who regales us with his glory days flying Cessnas beneath bridges and power lines for fun. The bulk of day one centers on understanding airspace regulations and flight restrictions, how to understand an airspace map, and then a deep dive into the physics of drones. Without knowing how these things really work you’re at a serious disadvantage in terms of understanding the tradeoffs required during project planning and field operations. This type of material can be a little daunting to beginners, but the folks from the University of Southern Denmark are masters of clear exposition. Before long even the most novice among us is speaking the language of servos and gyros, and musing on the requisite number of satellites to acquire and maintain a secure GPS lock. By the end of the day, our colleagues from Esri and Hexagon Geospatial have pulled all of this back together into a luminous discussion of spatial data integration and image-based information products. Following the closing simulation, the group gathers up their things and heads for the train back into chilly central Copenhagen. I’ll be leading a session in the next couple of days on interagency collaboration in humanitarian UAV operations. The Culpeper and Copenhagen trainings offer plenty of food for thought on that front. Within a week, we’ve been joined on both sides of the Atlantic by universally enthusiastic colleagues from AAAS to FEMA to Last Mile Health to Greenpeace, the World Food Program and the International Organization for Migration among others. A new generation of aerial humanitarians is coming into being all around us, eager to work together, ready for liftoff. It’s a wonderful thing to behold.